Near or far, Brothers and Sisters love each other from their heart. 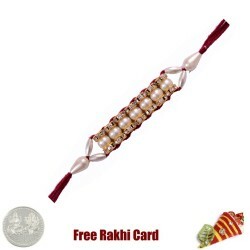 Celebrate this Raksha Bandhan beyond the border and send beautiful Rakhis and special Gift Hampers to your Brother living in Canada and remind him about how much he is loved. Don't miss this chance. 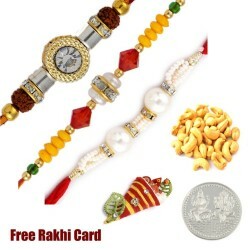 One of the most beautiful festivals that are celebrated by the Hindus is the festival of Raksha Bandhan. It highlights the love that a Brother and a Sister have for each other. 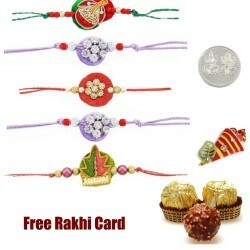 Following the age old customs, a Sister ties Rakhi on the wrists of her Brother and presents him with some sweet on this day. 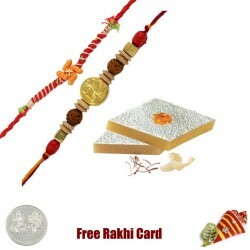 In exchange for Rakhi, a Brother promises to be her guide and help her through the thick and the thin. As we grow up, we sometimes have to move to different cities or maybe to different countries. Don't let this geographical space come between you and your Brother. 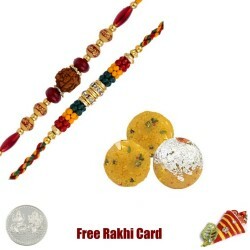 If your brother lives in the peaceful country of Canada, you can send Online Rakhi to Canada with MyFlowerTree. 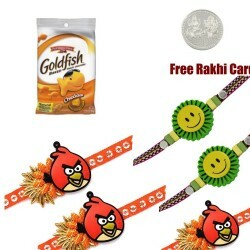 Online Rakhi Delivery in Canada is now easy with MyFlowerTree. We deliver internationally because we don't want anything to come between you and your Brother on any occasion. 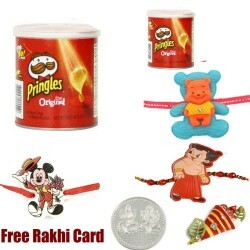 You can send Rakhi to Canada comfortably with just some clicks. 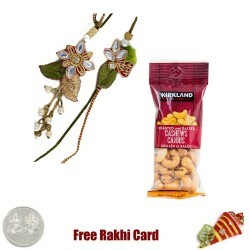 No matter where you stay, if your Brother is in Canada, you can wish him on this Raksha Bandhan with adorable Rakhis and amazing Gifts. 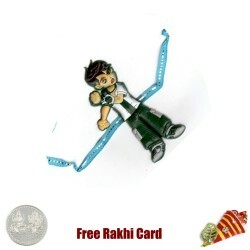 We have an exquisite range of Rakhis that your Brother will love for sure. 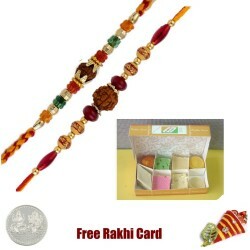 We have traditional Rakhis, Fancy Rakhis, Pearl Rakhis, Kundan Rakhis, Lumba sets and Kids Rakhis. 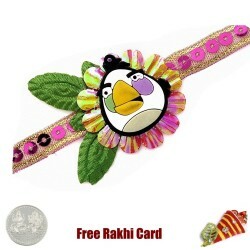 It is hard to buy a single piece as most retailers want to sell their Rakhis is sets but with MyFlowerTree, you can even send a Single Rakhi to your brother. 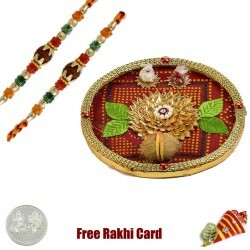 Rakhi Online Shopping that can be done through MyFlowerTree is going to make your Day extra special. 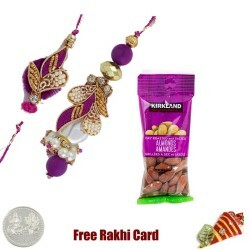 You can shop for the most beautiful Flowers and the most delicious Cakes without going anywhere and surprise your Brother on this Raksha Bandhan. Our collection for Flowers has Roses, Lilies, Gerberas, Birds of Paradise, Orchids Carnations, Peonies and many more flowers that are available in the USA. Pineapple, Vanilla, Strawberry, Kiwi, Mango, Ferrero Rocher, Nutella, Chocolate Cheesecake, New York Cheese Cake, Mixed Fruits, Chocolate, Chocolate Truffle, Black Forest, German Chocolate, KitKat, Gems, Oreo, Oreo Cheesecake, Strawberry Cheesecake, Caramel, Coffee, Coffee Caramel, Hazelnut and more; our Cake collection has endless flavours which are available in round, rectangle, square and heart shape. 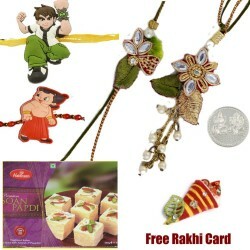 The Cakes and Flowers are the best things that you surprise your Brother with on this Raksha Bandhan. He is going to love you even more with these simple gestures. 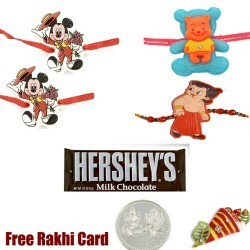 With MyFlowerTree, you can send Rakhi to Canada but also to various other countries like the USA. Africa, Australia, Germany, France, London, Dubai, Bangkok, Malaysia, Sri Lanka, China, Japan, Nepal, Croatia and all the other major foreign countries. 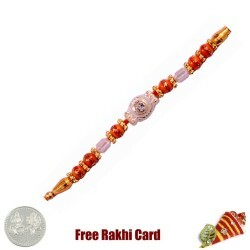 It is a two way road as you can send Rakhi to India as well if you live in other country. We deliver in all the major cities and also cover a large number of remote cities which are hard to reach. 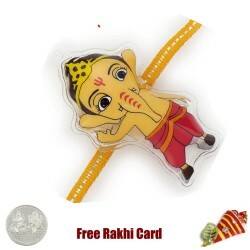 So, celebrate this festival with MyFlowerTree and make for a joyous celebration. Products in this category have been rated 4.7 out of 5 based on 121 reviews.